This review is of the cut shown at the BFI London Film Festival in October 2018 – it is currently listed for a Netflix launch on November 9th 2018. The last time Chris Pine teamed with director David Mackenzie, it was for the excellent neo-Western drama Hell or High Water, which was not only one of the best movies of that year, but also showed that Pine was an actor capable of a hell of a lot more than the pretty-boy heartthrob he had previously been sold as being in his career. For their next film together, the Netflix epic Outlaw King, the dynamic between actor and director is still standing on its own two feet, but while the film is certainly cinematic and very much a crowd-pleaser, it doesn’t have quite as strong a script or focus as their last film together. Nevertheless, this remains an impressively crafted piece of filmmaking that has enough qualities to make it worth recommending. Taking place in Scotland during the early 1300s, shortly after William Wallace tried and failed to lead the Scottish people against the English crown in a battle for independence, nobleman Robert the Bruce (Pine) is among the Highland lords trying to live with their defeat and constant interference from King Edward I (Stephen Dillane) and his ruthless son the Prince of Wales (Billy Howle), while Robert is gifted with the King’s goddaughter Elizabeth de Burgh (Florence Pugh) as a wife. However, things soon become too much and Robert, now crowned King of Scots, begins mounting an army against the English to take back control of their land, gaining allies such as the wronged Scottish knight James Douglas (Aaron Taylor-Johnson) in the process, while also facing increasingly brutal retaliations by the Prince of Wales and his own army, leading up to the Battle of Bannockburn which marked a significant turn in the First War of Scottish Independence. Be honest, while you were reading that plot, you were thinking about Braveheart this whole time, weren’t you? It’s okay if you were, because it’s impossible to watch this movie without having that Oscar-winning Mel Gibson movie on your mind; both movies take place around the same time (although Outlaw King opens with William Wallace already on the run) and while they focus on different historical figures – Braveheart being about Wallace whereas this one is about Robert the Bruce – they each have similar themes of rebellion and liberation with the outnumbered Scots going up against the mighty force of the English army. The comparisons are so great that I can see most people viewing this movie in a slightly more negative light next to Braveheart – though I somehow doubt this movie has many notable historical accuracies as that film did – but director Mackenzie gives his movie a respectable amount of epic quality in the numerous battle sequences, which are filmed in ways that you can just about see what is actually going on without getting too close for comfort, and its other production values from the sets to the costumes to the cinematography (there is an opening unbroken shot which is quite marvellous to see unfold) which show how strong a filmmaker he really can be, even when working with material that’s not among his best but perfectly serviceable all the same. Mackenzie has a great cast of actors lined up to play their roles almost perfectly, with standouts including Billy Howle as the foppish, whiny and rather pathetic Prince of Wales who’s a good villain for this sort of movie, and especially Florence Pugh who’s essentially playing a nicer and slightly less murderous version of her character in Lady Macbeth, but is such a good actress that she sells her scenes as though they were nothing. The weak link of the entire cast, surprisingly, is Chris Pine; beyond the fact that the American Pine adopts a Scottish accent that’s at times solid while at other times pretty ropey, he doesn’t look entirely right for the part. Pine is an actor I do like, whether it’s in big-budget fare like Star Trek or Wonder Woman or smaller but no less powerful movies like Z for Zachariah or, indeed, Hell or High Water, but here it feels like he’s just playing a part rather than he is really sinking into the skin of this Scottish king, and it can be rather distracting by how much he really doesn’t fit alongside many of the other actors he’s working against. But beyond even that, the character isn’t written in an interesting way and comes across more like a stoic authority figure than someone with an actual morality crisis, and you’re only following along with this character because he’s the designated lead as well as the fact that he’s being played by a Hollywood A-lister, whereas many other characters in this story – whether it be Aaron Taylor-Johnson’s vengeful knight or even Pugh as the English wife of a king seen as inferior to her very people – are much more interesting and worthy of a leading role than he is. Interestingly, Mackenzie originally debuted a slightly longer version of this film at the Toronto Film Festival, but after mixed reviews he went back and took out about twenty minutes’ worth of footage, making the version I saw the very first time the newly-cut edition of Outlaw King had been shown to an audience. Of course, I cannot say how this version differs since I didn’t see the original uncut edition, but I might have been able to see some of the places where footage might have been cut, because there are some scenes that just end abruptly and sometimes conversations will feel like there was more to be said but it just cuts to something else. Who’s to say, but it really didn’t matter all that much; I didn’t feel like my time was wasted with this movie, and while I don’t think it’s as noble a Chris Pine-David Mackenzie team-up as Hell or High Water, it’s a serviceable historical epic that’s noble enough. 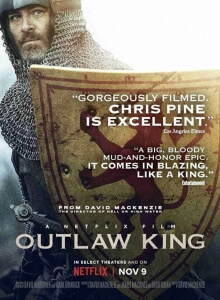 Outlaw King has some impressive production values including strong battle sequences and impressive cinematography, not to mention a mostly strong cast, but comparisons to Braveheart as well as a lacking lead performance by Chris Pine hinder the film from standing on its own.